President Obama is in Saudi Arabia this week, his farewell presidential visit to America's most important Arab ally. He is due to meet King Salman, attend a summit of Gulf Arab leaders and reassure them that Washington remains engaged in their region and alert to their concerns, notably a suspicion that the US is slowly abdicating from its Middle East commitments. Behind the red carpet welcome and the official press briefings there are signs of real strain in the 71-year-old US-Saudi strategic partnership. So is it just a blip or is the relationship now in terminal decline? Whatever polite words the Saudis may utter in public, for them, President Obama is the living embodiment of their disappointment with the current US administration. Their list of grumbles and frustrations grows ever longer and is unlikely to be resolved by this important yet fleetingly brief presidential visit. The White House too has its own frustrations with Riyadh, some of which have spilled over into public comments. In short, the relationship is not broken - Saudi Arabia and the US still need each other - but their alliance is probably under more strain now than at any time since the 1973 Arab-Israeli war. Here are some of the bones of contention. US Congress is currently contemplating a bill that could hold Saudi interests legally liable for the 9/11 terrorist attacks of September 2001. Fifteen of the 19 suicide hijackers were Saudis but the 9/11 Commission officially cleared Saudi Arabia of blame and the White House has threatened to veto the bill. If it were to pass, then the Saudi government has reportedly threatened to liquidate between $750bn and $1tn of US assets in response. Even if the bill gets no further it is an uncomfortable reminder that many Americans still suspect a secret Saudi role in the worst terrorist attack in history on their mainland. President Obama wants the two, seemingly implacable Middle East rivals, Saudi Arabia and Iran, to settle their differences and agree to "share" the region between them. That, say experts, is not about to happen any time soon. Both countries are locked in a proxy struggle across the region that pits Saudi interests against those of Iran - Sunni allies against Shia militias. The Saudis feel surrounded. They fear that thanks to the disastrous US-led invasion of Iraq in 2003 the Iranians are now the controlling power in three Arab capitals: Baghdad, Beirut and Damascus. They also accuse Iran of backing violent Shia insurgencies in eastern Saudi Arabia and Bahrain, and the Houthi movement in Yemen. The Saudis are deeply suspicious of the recently brokered deal to curb Iran's nuclear ambitions in exchange for the lifting of sanctions. They worry that Iran's Revolutionary Guards Corps (IRGC) will use some of the new money to fund their military activities around the region. They also worry that Washington is laying the foundations for eventually transferring its major strategic alliance in the Gulf from Saudi Arabia to Iran. The influential former Saudi Ambassador to Washington, Prince Turki Al-Faisal, described this as "the US pivot towards Iran". This topic is likely to dominate much of President Obama's talks on Wednesday and Thursday. Saudi Arabia's King Salman has never forgiven President Obama for backing down from conducting air strikes on the Syrian regime after it was accused of gassing its own people in 2013. The Saudis see this as weak and indecisive behaviour that has contributed to the continuing misery of the Syrians. Convinced that the US is not really committed to ending the Syrian conflict, the Saudis are forging their own alliances, with the Sunni leadership in Turkey and with Sunni militias on the battlefield. Saudi Arabia remains officially a member of the US-led anti-Islamic State (IS) alliance and its warplanes were recently deployed to southern Turkey. At the Munich Security Conference in February, the Saudi foreign minister stated categorically that IS would never be defeated while Syria's President Bashar Al-Assad remained in power. But Washington has cooled its efforts to get rid of him and the Saudis have recently announced their own "Islamic Coalition" of Sunni countries to combat terrorism and promote their own agenda. The Saudi-led coalition has now been conducting air strikes on Yemen's Houthi rebels for more than a year, at enormous cost to both sides. More than 6,000 Yemenis have died, not all from air strikes, while the war has cost Saudi Arabia an estimated $5.8bn at a time of budget deficit. The US is uncomfortable with this seemingly unwinnable war yet it continues to provide Riyadh with intelligence, refuelling and hardware. While the war rages on, the US and Saudi continue to co-operate on hitting al-Qaeda bases in southern Yemen with unmanned drone strikes. The days of almost total US dependency on Saudi oil for its energy needs are gone, thanks to US domestic production, including shale technology. While this has removed a major bargaining lever for Riyadh over Washington, the Saudis have kept up their own production quotas so that global prices remain so low that it has become uneconomical for many US producers. Iran too is hurting from the global over-supply and while Saudi Arabia can, for now, afford to keep pumping at high capacity because its upstream costs are so low it will soon need higher prices to help balance its books. The two countries are unlikely to ever see eye-to-eye on this thorny issue but the US president is expected to raise it in talks this week. Washington has expressed alarm at this year's mass execution of dozens of convicted criminals, including a charismatic but firebrand Shia cleric, Nimr al-Nimr. The human rights organisation Reprieve has urged President Obama to intervene on behalf of three Saudi prisoners who, it says, were juveniles at the time of their arrest. 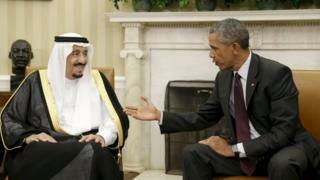 Reprieve says the US leader's visit comes "amid a huge surge in repression in the Kingdom". None of these issues is likely to be laid to rest this week to the complete satisfaction of both parties. Washington and Riyadh will remain partners, and the multi-billion dollar defence alliance will endure. But there is now a degree of mutual mistrust. In the words of Zaid Belbagi, from the Oxford Gulf and Arabian Peninsula Studies Forum: "For those in the Arab world there is today a chasm between the White House's current lack of commitment to the region and Mr Obama's 2008 speech at Cairo. "This visit has all the features of a visite d'adieu as opposed to signifying any renewed commitment to Arab issues."